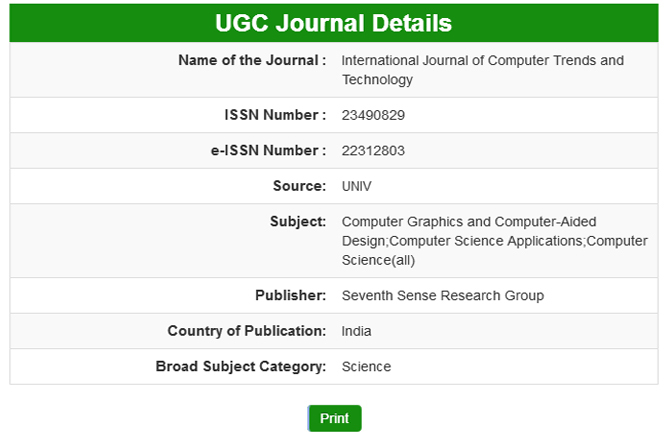 International Journal of Computer Trends & Technology - IJCTT is a double blind peer reviewed International Journal in the computer field published by Seventh Sense Research Group, is an international forum for scientists and engineers involved in all aspects of computer trends and technology to publish high quality and refereed papers. Papers reporting original research and innovative applications from all parts of the world are welcome. Papers for publication in the journal are selected through rigorous peer review, to ensure originality, timeliness, relevance, and readability. While the journal emphasizes the publication of previously unpublished materials, selected conference papers with exceptional merit that require wider exposure are, at the discretion of the editors, also published, provided they meet the journal's peer review standards. The journal also seeks clearly written survey and review articles from experts in the field, to promote insightful understanding of the state-of-the-art and technology trends. Topics covered by Journal of Computer Science and Technology include but are not limited to: Computer Architecture and Systems, Artificial Intelligence and Pattern Recognition, Computer Networks and Distributed Computing, Computer Graphics and Multimedia, Software Systems, Data Management and Data Mining, Theory and Algorithms, Emerging Areas. IJCTT is the flagship publication of Seventh Sense Research Group (SSRG).